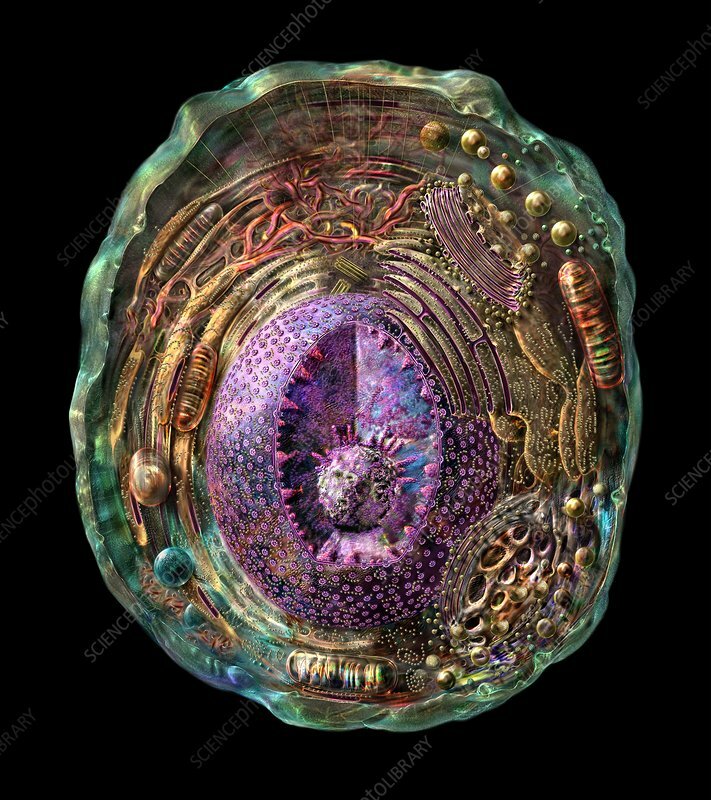 Animal cell, cutaway illustration. The cell membrane (green) surrounds internal structures (organelles) that include the nucleus (purple), which contains the nucleolus (sphere, lower centre). The nucleus contains the DNA (deoxyribonucleic acid) that controls protein synthesis on ribosomes (chains of small yellow spheres) in the rough ER (endoplasmic reticulum, membrane folds, above and at right of nucleus). The proteins are stored in the flattened membranes of the Golgi complex (above and at right of rough ER). Energy is generated by mitochondria (cylinders, one at bottom centre). Cells are the microscopic structural and functional units of all living organisms. See C030/8419 for a plant cell.